Package includes: Hammered Copper Kitchen Apron Single Basin Sink, Oil Rubbed Bronze, 33-Inch. Single Handle Kitchen Faucet with Pullout Spray, Oil Rubbed Bronze. Solid Brass Soap or Lotion Dispenser, Oil Rubbed Bronze. Deluxe Garbage Disposal Drain with Basket, Oil Rubbed Bronze, 3.5-Inch. Copper Sink Wax Cleaner. Installation Silicone. This 33-Inch Optimized Hammered Copper Kitchen Apron Single Basin Sink is optimized to allow ample room to deck mount your faucet in a standard 25-Inch countertop. The Hammered Copper Kitchen Apron Single Basin Sink has the following dimensions: inner 31-Inch by 19-Inch by 9-Inch, outer 33-Inch by 22-Inch by 9-Inch, apron depth 9-Inch. Installation Type: under counter or surface-mount. Countertop Depth Required: 25-Inch front to back. Material gauge: Industry Best (14-guage or .0625-Inch). Drain Size: 3.5-Inch. 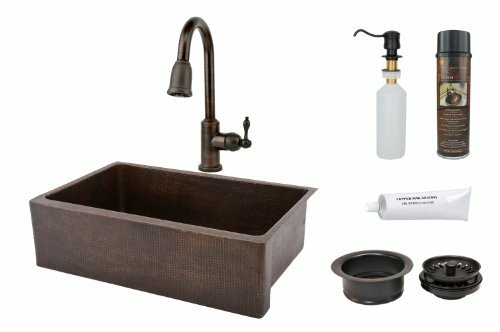 Sink is handmade, 100-Percent recyclable and made of 99.7-Percent pure recycled copper. It is also lead free. Faucet features drip free ceramic disc cartridges, a retractable hose spout that extends up to 8.44-Inch and dual spray options (stream or spray). Faucet dimensions: overall height: 16.69-Inch, overall width: 12.44-Inch, spout height: 9.25-Inch, spout reach: 8.44-Inch, spout swivel: 360-Degree. The faucet mounting position is counter deck mount. Maximum deck thickness: 2.25-Inch. Mounting shank length: 2.5-Inch. Mounting shank diameter: 1.25-Inch. Disposal Drain with Strainer Basket has the following dimensions: inner 3.5-Inch, outer 4.25-Inch. Disposal drain is In-Sink-Erator Brand compatible. The Soap or Lotion Dispenser's top comes off for an easy above counter refill. Dispenser dimensions: above counter height: 3-Inch, overall height: 12-Inch, spout reach: 4-Inch, thread length: 2-3/8-Inch. Can be used with thin or thick countertops. Maximum deck thickness: 2-1/8-Inch. The wax cleaner is made from natural bee's wax. No wax build up ever. Wax cleans copper sinks, tubs, accessories, marble, granite and more.